As a Singaporean, we know that eating never ends for us. While other countries have meteorological seasons to mark the passing of time, we here have eating seasons, and each comes with its own delicacies. For Chinese New Year, the menu goes like this: pineapple tarts, almond cookies, and of course it won’t be Chinese New Year without bak kwa. 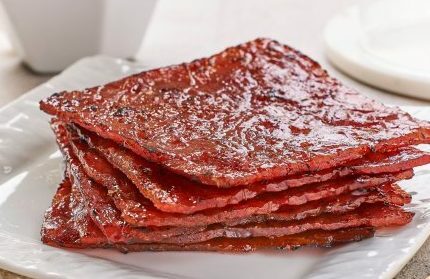 Bak Kwa (肉干) is a preserved meat, similar to jerky. It is traditionally made from pork, which is marinated and grilled. This delectable slice of goodness hits all the flavour profiles: sweet, savoury, salty and infused with a smoky char from the barbeque. Every year, newfangled flavours are introduced into the market. 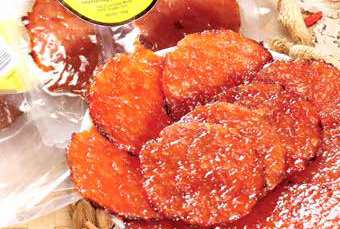 This phenomenon has been seen in cocoa pineapple tarts, and of course, bak kwa is no exception. Here are some wacky flavours to look out for this Chinese New Year! 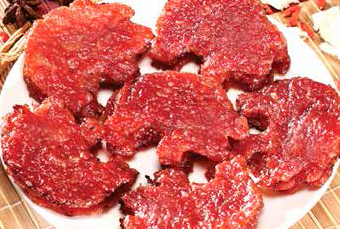 Don’t be deceived by this piece of innocuous bak kwa! A blend of both savoury and sweet, it sure does pack a punch in the flavour department. Due to a large percentage of lean meat being used, the pineapples prevented the end product from becoming too tough. They were also able to tenderize the meat sufficiently, achieving that divine melt-in-your-mouth texture. Close up, you can even see pineapple shreds amongst the meat. That was how we knew that fresh pineapples were used! The texture was chunkier than other bak kwa slices, but it provided quite a substantial mouthfeel. This zesty, tropical taste of pineapples made it delightful to eat as it was light on the palate. Something refreshing amidst the other surfeiting snacks! Despite being notorious for its title as the smelliest fruit in the world, the durian is still held in high regard over here in Singapore. Singaporeans are known for their fealty to durian. 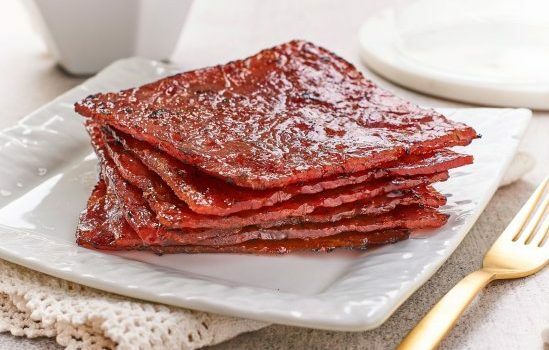 Thus, it should come as no surprise that some manufacturers have incorporated this fruit into bak kwa. Presenting to you the durian bak kwa! Each piece is individually grilled to achieve the smoky char. With actual mao shan wang durian flesh added into the classic CNY staple, it sure does justify its pricy label of $120/kg. Biting into a slice of this gives you a caramel-sweet taste, leaving behind a strong aftertaste of durian. Durian lovers, you’re in for a treat! Be sure to give this a go if you love durian and bak kwa. If you’ve never heard of Kurobuta pork, it’s basically the equivalent of wagyu in the pork world. This premium cut of pork is particularly tender as it has a higher fat content, keeping it moist and juicy. Grill it to perfection and it’s practically perfect. Each bite was succulent and bursting with flavour. The taste of herbs and spices lent it a distinct flavour, but were not overpowering. Be proud to display this on your table when you have guests over – it’s pig shape will be sure to provide many conversation starters. 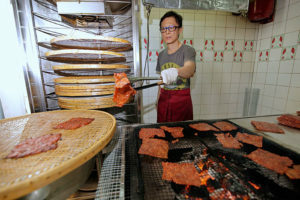 From the same manufacturer as the Kurobuta bak kwa comes another unique flavour of bak kwa: Crocodile! Yes, it’s made from actual crocodile meat. Traditional Chinese medicines often include crocodile meat in their tonics and medicines because of its cooling properties. While we’re not sure if this is true, at least we know that we have an excuse for going for a second helping! However, be warned that these are denser than the conventional bak kwa, and chewier as well. 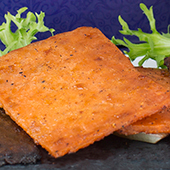 It’s not just any fish – salmon, tuna, and marlin fish are used in this seafood version of bak kwa. It’s labelled “fish jerky” on the packaging and that’s exactly what it tasted like. The tuna was marinated with chilli and pepper, and offered a comforting, warm sensation as we chowed down. The salmon version leaned towards the oriental flavours. A generous coating of teriyaki sauce glazed the surface and was topped off with roasted seaweed, imparting another layer of taste. Had they not been individually sealed, we would have finished the entire packet within minutes!